The photographs below are from a property in the small village of Mayfield, located within the High Weald civil parish of Mayfield and Five Ashes in East Sussex. 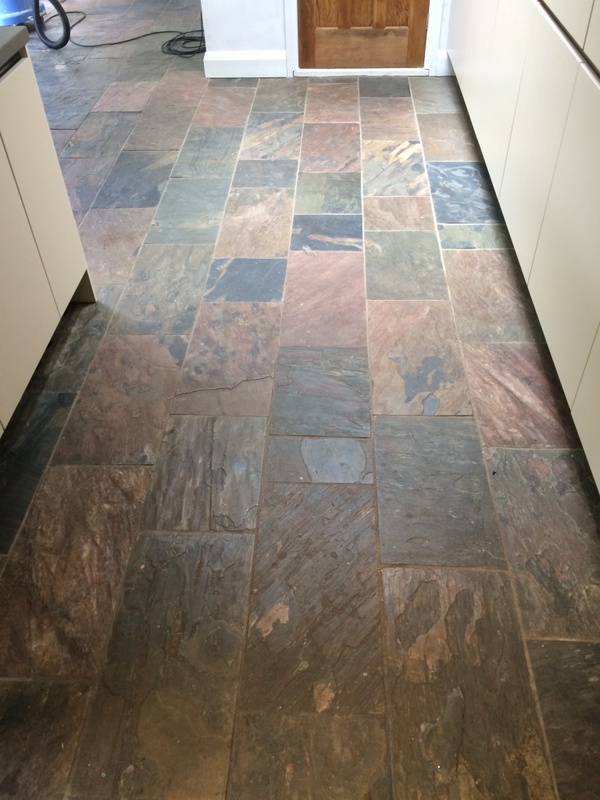 The village is perhaps best known for its annual carnival and torchlight procession however on this occasion I was there to revamp the Slate tiled kitchen floor. The tiles had been left worse for wear by the previous occupants where years of children and mucky dogs had taken its toll on the slate. Whilst I would normally utilise my buffing machine with a black buffing pad as part of the cleaning process for natural stone tiles, I was unable to do so in this case as the Slate tiles in the kitchen were riven which would of cut into and potentially shredded the pad. As a result, I had to clean the floor by hand. I did this using a solution of one part Tile Doctor Pro-Clean to five parts clean water, which I worked into the tiles with a deck brush, followed by a hard brush. The solution needed will vary in accordance to the level of soil build-up on the floor. In this case, the soil build-up was light enough to use quite a diluted solution, but in a case where a floor is very heavily soiled I would recommend using a more concentrated solution of one part Pro-Clean to two parts water. After a period of scrubbing with the hard brush, I sucked up the muck that had been removed from the surface with a wet-vac machine. I then continued with the cleaning process for several hours, before once again using the wet-vac machine up any excess moisture left by the cleaning solution. I left for a period of two days to allow the floor to dry completely before I returned to seal the floor. I instructed my client to keep the floor completely dry because any excess moisture would potentially impact negatively on the performance of the sealer. 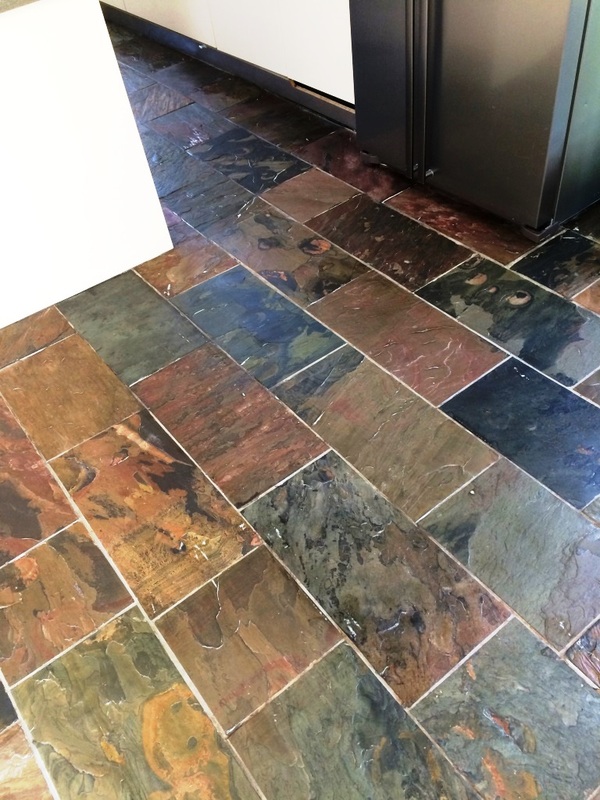 To seal the floor I used Tile Doctor Colour Grow, a colour intensifying sealer which gets into the pores of the stone protecting it from within. 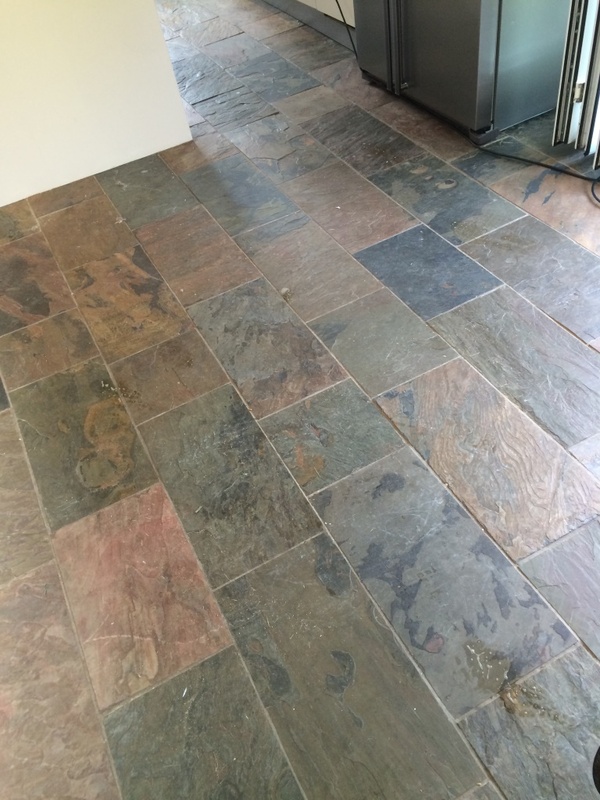 In this case I applied two coats of Colour Grow to really bring out the range of fantastic natural colours and shades in the Slate, whilst also providing durable surface protection for this high-traffic kitchen area. My client was very impressed with the results. I hope she enjoys this brilliant feature of her new home, now full of life and colour once again. 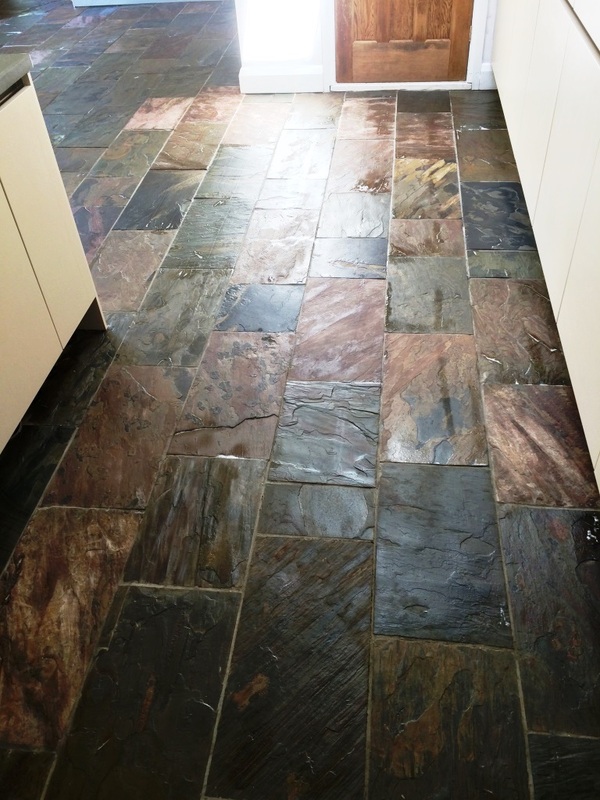 This entry was posted in Slate Tile Posts and tagged east sussex, kitchen, mayfield, slate tiles, tile cleaning, tile sealing by AbzDominise. Bookmark the permalink.